Disclaimer: I received something of an “angel investment” of gold coins (the in-game currency you can purchase), which allowed me to progress through content quite a bit faster than normal for the purposes of reviewing. The review I gave is fair and unbiased, though the head start did offer me an experience that may slightly differ from your own. What do you say about another AdVenture Capitalist clone? If you’ve ever played one of these entrepreneurial, idler time sinks, then you’ll know exactly what to expect from this title and can skip down a section to the nitty-gritty differences. If you value your time, unlike me and countless others that waste breath on these abominations, then do yourself a favor and run away now. Go ahead. I won’t stop you. Still here? So be it. Firstly, this game is still in Early Access, which can be pretty obvious at times. Secondly, this game is a top-tier, business-sim idler. I mean it. All you have to do is get past the annoying first fifteen or so minutes. The game opens up on a newspaper screen that is designed to show how much money you made while away, give you cutesy backstory, and generally entertain you. If you scored as low on the SAT as I did though, it may take you a moment to realize you need to actually click this screen to progress. (Go ahead, laugh at the dumb kid.) Anyway, once you clear that hurdle, a wildly disproportionate Cancan dancer in a graduation cap appears, claiming to know how to run several big businesses. Give her ten minutes of slow hand-holding and she guides you through the initial tutorial. This little trip nearly costs Wild West Saga an entire point by itself, despite being thorough and welcoming to new players. Suddenly armed with the knowledge of a Fortune 500 company CEO, you buy your first business in the form of a Chinese laundry. After that, Ms. Know-it-all sort of takes the wheel again and gets you up to speed buying several more businesses, all with the same ease as Amazon 1-Click. Then, without warning, the line between clicker and idler is blurred. You smash your mouse key, desperately trying to acquire more saloon profits before your multiplier is up, but you also really want to catch the end of that Supernatural rerun. Do you idle or click? You panic and do both, because that’s what this game is made for: wasting time and ignoring responsibilities. Mission accomplished. Order a sarsaparilla and take a load off. Revel in the glory of beautiful animations; all the result of your own “hard” work. Or, get really ambitious and click three or four times more! What I’m trying to say about this game is that it truly puts the nail in the pre-built coffin (a funeral home upgrade by the way). Meaning, everything about it is as fun and addicting as any other AdVenture Capitalist clone or clicker-type. In this particular case, you’ll be hounded by tons of gold coin spending offers, so be prepared. But, you really cannot go wrong with a free-to-play product that has this level of thematic presence. However, if you’re a clicker-connoisseur, you made need more persuading. Allow me to oblige you! You’ve really done it this time, partner. You’ve delved into the world of actually caring about the kind of clicker you click. You’re a monster and you make me sick. Just kidding — I care, too. Want to know what makes this outlaw title unique? Tons of useless mechanics! So, you already know the game is Wild-West themed by now I’d wager. With that, comes some mildly interesting secondary gaming traits. For example, in many AdVenture Capitalist clones, there are in-game progress barriers that, once removed, guide you to a unique new experience or environment in which to click. In Wild West Saga you get the progression-optional “Go West” button. This button effectively works the same as a standard business reset that maintains your multipliers earned and gives you a bonus currency, which here, is pioneers. However, what makes this reset unique is that the location of your businesses actually change. Once you raise the population of a certain city by building your empire up, you progress to the next city, and the next, and the next. Each city wants you to gain increasingly more population and every few towns you must face a large city that has a much steeper requirement. For some reason, this makes the reality of doing nothing feel less worthless. Another great difference lies in the way you obtain business multipliers. Prepare to pay a little Hearthstone homage as you’re introduced to patents: Patents exist as cards that fill slots on your Patents menu. Each one offers a unique bonus to a certain business or businesses. They are acquired by purchasing patent packs and they, like most card-buying microtransactions, come in varying rarity. You can also obtain them by utilizing the “Ad features” that are prohibited on Steam but somehow still made it through the port process. Essentially, you get some free cards every so often, with no ads. (Yay!) You can also earn them by completing towns and by purchasing special bundles. Each card has an artistic rendering of a wild west scene and usually some attempt at a witty pun. The Wild West Saga team could have benefited tremendously from hiring a professional joke writer or the like, as many of these puns missed the mark, although you might appreciate their effort anyway. Are you tired of clicking so much that your finger hurts? Well, so is everyone else. Introducing click managers! Just like other games in the genre, click managers manage the clicking for you. While this feature is not unique, the names of the characters are. Every once in a while, you’ll come across a particularly witty name and gently giggle at the screen that should contain your college work. Oh, and the pioneers I mentioned earlier? They’re used to purchase extra special managers that grant awesome bonuses to your cash flow. Just be careful how you spend those pioneers, as resets eat into your time quickly. One final interesting mechanic is the piano. While the piano plays, your profits are doubled. How do you keep the piano playing? Click it, silly! So, if you really go hard at this game, you can click stuff until you pass out from exhaustion. Be warned, though: despite the saloon music having some serious charm, it can get terribly repetitive. My first two hours I played with the sound on, but had to mute it all after that, including the great sound effects. Amongst the backdrop of pleasing Wild West themes and sound effects, you can melt your tired brain and enjoy some flashy animations that tell you you’re doing such a great job. But be warned, drifter: the jokes they tell around these parts can cringe a man right into the funeral home he owns; and if you want patents, you’ll need to pay for a healthy collection. The game brings enough originality to the clicker formula to make it interesting and replayable, but not enough to call it innovative. 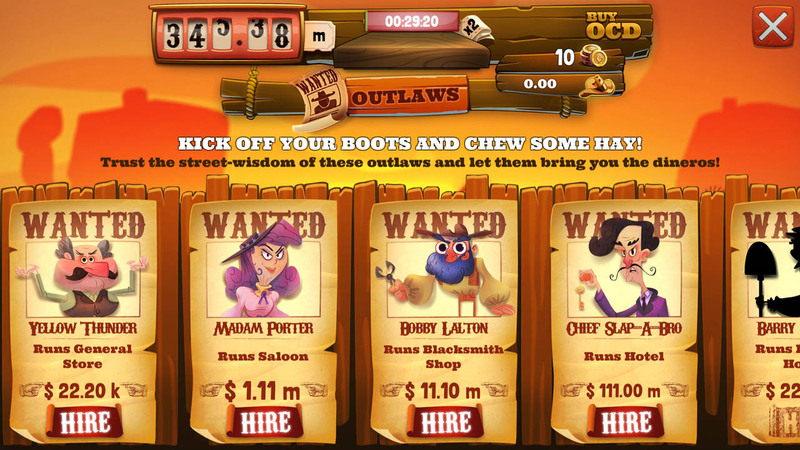 Wild West Saga: Idle Tycoon still sits as one of the fastest clickers in the West. Johnathan only cares about one thing: When is the next Elder Scrolls coming out? Everything else is just something to do while he waits. An avid gamer and obsessively passionate writer, Johnathan can often be found being a filthy Gold League of Legends player and typing in all chat. When he isn’t playing Elder Scrolls games, League of Legends, or downing a whole pizza, he is writing to The Behemoth to convince them to make Castle Crashers 2. There, he is known on a first name basis. Be gentle, Senpai, and have a great morning.